Knowledge, Skill and Personal Competence (upon application):Candidates must be numerate and literate with the capacity to learn new skills and absorb varied product knowledge. All applicants must be proficient in spoken and written English in order to successfully complete the academic requirements of the ICTAP. In addition, candidates must demonstrate a capacity to work as a member of a team and display a capacity to clearly communicate with others. Each candidate must demonstrate a level of personal motivation and a clear desire to work in the field of ICT. Applicants must be able to attend classroom training between Mondays and Fridays from 8:30am to 5:00pm during the two years of their training period. On days when apprentices are scheduled to be at the employer’s location they must similarly be able to attend during the employer’s working hours. This includes the requirement for the apprentice to have access to public or private transport in order to get them to the required location on time. Secondary School Leavers (Republic of Ireland): Candidates should have completed a Leaving Certificate with pass grades in at least five Ordinary level subjects (including Maths and English) or a 06/H7 or higher in the Leaving Certificate in five or more subjects. School Leavers (Northern Ireland or the United Kingdom): Candidates should have completed a level of second-level education equivalent to the Irish Leaving Certificate. This may be composed of the attainment of ‘A Levels’ subject based qualification (General Certificate of Education). Other Nationally Recognised Further Education / Awards (Republic of Ireland):Applicants who have successfully completed further education award(s) that are nationally recognised, such as those accredited by QQI or its predecessor organisation FETAC may also apply e.g. applicants who have achieved a NFQ Level 5 Major Award in Software and Systems. Other Nationally Recognised Higher Education / Awards (Republic of Ireland):Applicants who have successfully completed higher education award(s) that are nationally recognised, such as those accredited by QQI, HETAC or older NCEA awards may also apply. Candidates are advised that this attainment would need to constitute a substantial body of learning in excess of 60 ECTS credits of attainment. International Qualifications (outside the Republic of Ireland):Candidates who wish to apply and who have completed a programme of education and training from another jurisdiction may also apply. However, candidates are advised that these qualifications will be compared to their respective standing on the National Framework of Qualifications (NFQ), utilising the Quality and Qualifications Database (NARIC). In addition, it may be necessary on a case-by-case basis to authenticate the attainment of the given award with the accrediting body or providing partner. 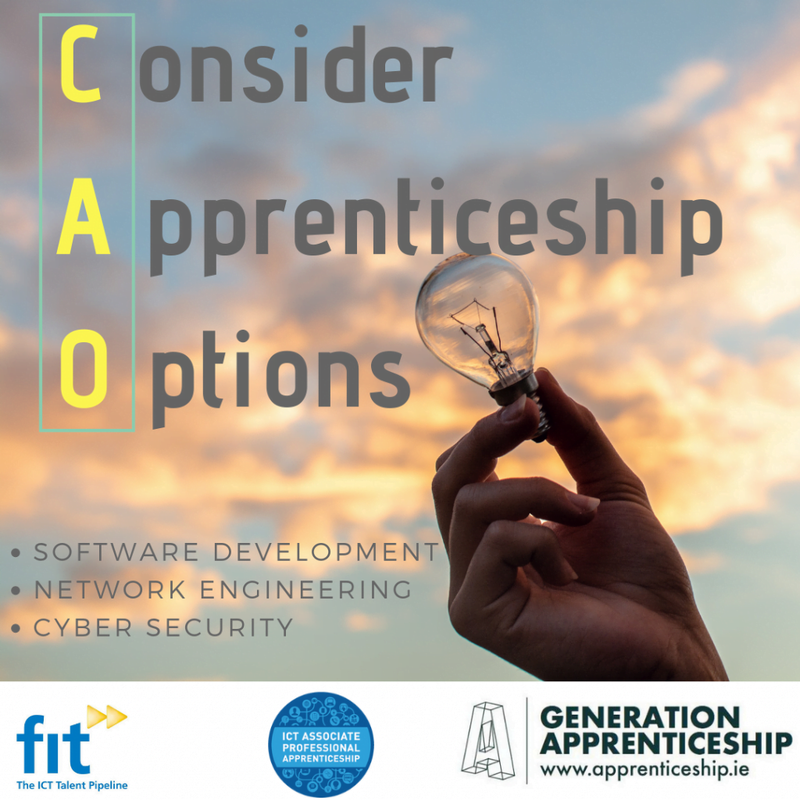 Candidate agreement to complete this process will be required before the registration of any candidate as an apprentice. Exceptional Cases & Mature Learners / Candidates:FIT recognise that from time-to-time there may be a small volume of individual cases that are not covered by any of the aforementioned entry routes. Candidates who wish to apply for entry, and who do not satisfy any of the other requirements are advised; that an evidenced and justifiable rationale will have to be provided for consideration to be entered into the selection process. This will include the submission of a detailed synopsis of previous educational, life and/or work experiences. The FIT Registrar or delegate will review such cases with regard to the FIT Policy on Access, Transfer and Progression (FIT-ATP-001). The Registrar or delegate’s decision is final. Please note that you will be required to present a copy of your qualifications (as outlined above) when you attend FIT Ltd for interview. Therefore, if you do not currently have a copy you should seek one from the relevant authority immediately. Initial Vetting: An initial assessment of your online application will be completed by a specialist from FIT Ltd. Candidates who are potentially suitable will be invited to sit an aptitude test at a location determined by FIT Ltd.
Aptitude Test Successful: Candidates who achieve acceptable results in the aptitude testing will be invited for interview by a FIT specialist. FIT Interview Successful: If the candidate is successful in their interview with FIT Ltd they will be provided with further feedback on their CV. Ready for Employer Interview: Candidates must consider any feedback provided by FIT and make changes to ensure that the CV is suitable for distribution to prospective employers. At this point a candidate may also be invited to attend an Interview Preparation Workshop designed to support candidates in improving their interview skills. Placed: Every employer who has committed to hire apprentices will be offered a selection of CVs for their consideration. They will identify a subset of these candidates to be invited for interview by the employer. If successful in this interview the candidate may be offered a position by this employer. The offer of a post will also be contingent on the candidate’s compliance with any other requirements that the employer may have for new employees (e.g. medical checks). Apprentice Registered: When a job offer has been made and all of its associated requirements fulfilled, the candidate will be required to complete an Apprenticeship Registration form for SOLAS, and also attach a copy of their prior qualifications and a passport photograph.